Mix the flour, cumin and salt. Add the water and oil, knead into a soft, smooth dough, cover and leave to rest at room temperature for approx. 30 mins. Heat the oil in a pan, add the mustard seeds, toast them until they split open. Add the onion, garlic, ginger and chillies, sauté for approx. 3 mins., add the turmeric and salt. Add the peas and potatoes, cook for a further 3 mins. Add the lemon juice and coriander, leave the filling to cool. Divide the dough into 10 portions, shape into balls, flatten a little. On a lightly floured surface, roll out the balls into rounds (each approx. 17 cm in diameter). Cut the rounds in half, brush the cut edges with water. Fold each half into a cone shape, press the edges together firmly. Spoon in the filling to approx. 1 cm below the rim, brush the edges of the dough with water and press together firmly. 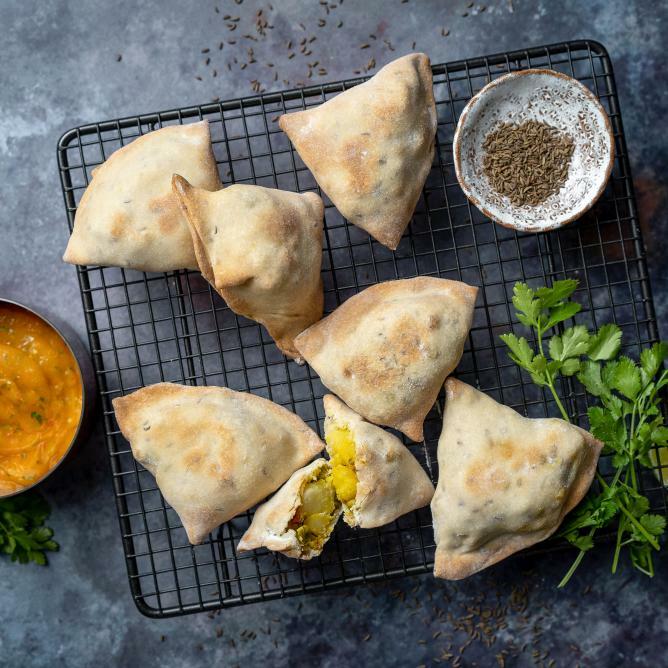 Shape the remaining samosas in the same way, place on a tray lined with baking paper. Approx. 15 mins. in the centre of an oven preheated to 180°C. Place all of the ingredients in a blender and puree until smooth. Serve the sauce with the samosas.